Comments: Dura-Heat® offers superlative lustrous dark green leaves that turn soft butter yellow in the autumn. The leaves are more leathery and smaller than other varieties and the species. 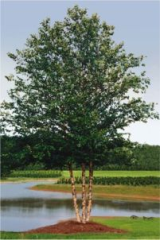 Leaves are closely spaced along the length of the shoots resulting in a dense canopy of foliage, even on young trees. Leaf spot resistance is significantly greater than that of other varieties and the species. Side-by-side comparisons of Dura-Heat® foliage against other varieties or the species leave no room for doubt about the superior foliage characteristics.